Carbohydrates: These macromolecules are comprised of hydrogen, oxygen and carbon molecules with the typical equal numbers of carbon and oxygen atoms and twice that number of hydrogen atoms. Lipids: Also referred to as fats, are macromolecules that are mostly comprised of carbon and hydrogen and are formed with the union of fatty acid and glycerol monomers. 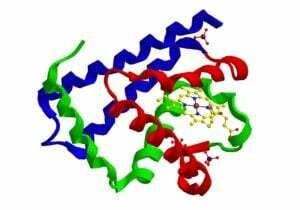 Proteins: Also referred to as polypeptides, these macromolecules of polymers are formed with the union of amino acid monomers held together with peptide bonds. Hydrophobic fibrous macromolecules: These macromolecules are not soluble in water. Dehydration synthesis: This process, also referred to as dehydration and condensation synthesis, is the process of removing water so that polymers can be bound together to form macromolecules. Hydrolysis: The addition of water to a macromolecule that is the opposite process of dehydration synthesis. Hydrolysis breaks the polymers'' bonds and releases energy and single monomers. Molecule: A collection of a group of one or more atoms with the same and identical element that are joined to each other with chemical bonds as based on the valence electrons of each of the atoms. Compound: A collection of a group of one or more atoms with different elements that are joined to each other with chemical bonds as based on the valence electrons of each of the atoms. Chemical structure of a polypeptide macromolecule. Simply stated, molecules are a collection of a group of one or more atoms with the same element that are joined to each other with chemical bonds as based on the valence electrons of each of the atoms. Molecules are joined atoms of identical elements, which are in contrast to a compound, which is the joining or union of different elements. For example, when hydrogen combines with oxygen to form water, this is a compound because hydrogen and oxygen are two different elements. When oxygen atoms, however, join with other oxygen atoms and when hydrogen joins together with other hydrogen atoms, these unions are called molecules because they are unions of the same element. A macromolecule is a quite large organic molecule that results when multiple monomers form it. A monomer is one of the molecules that join together to form polymers. Carbohydrates, referred to as disaccharides and polysaccharides, are formed with the union of monosaccharides. Enzymes are the biological catalysts that speed up the chemical reactions in the body but they are not altered or changed as a result of this reaction; they are simply a catalyst of these reactions which are necessary to life. They play a highly important role in terms of digestion and most other processes that are involved in metabolism. These enzymes are primarily proteins. Lactose is a disaccharide found in animal milk. It consists of a molecule of D-galactose and a molecule of D-glucose bonded by beta-1-4 glycosidic linkage. It has a formula of C12H22O11. Carbohydrates are comprised of hydrogen, oxygen and carbon molecules with the typical equal numbers of carbon and oxygen atoms and twice that number of hydrogen atoms. Carbohydrates play a highly important role in the body. Smaller carbohydrates, like glucose, are instant supplies of energy and larger carbohydrates, such as glycogen and starch, are stored energy sources for future energy that are not readily available for immediate energy use. In addition to the role of carbohydrates in terms of energy, carbohydrates form part of RNA and DNA and they also can be converted into amino acids; carbohydrates are also found on the surfaces of the white blood cells that fight off infection. Monosaccharides are the simplest of all of the carbohydrates; they are referred to as simple sugars. Glucose is an example of a monosaccharide carbohydrate. Disaccharides are the combination of two monosaccharide carbohydrate molecules which are linked together with the process of dehydration synthesis. Sucrose, maltose and fructose are examples of disaccharides carbohydrates. Polysaccharides are the most complex of all of the carbohydrate molecules. Polysaccharides are many and even thousands of monosaccharide carbohydrate molecules linked together through dehydration synthesis. For example, the stored glycogen in the liver as a source of energy is an example of a polysaccharide carbohydrate molecule with many strands and branches. Lipids, referred to as fats, are macromolecules that are mostly comprised of carbon and hydrogen and are formed with the union of fatty acid and glycerol monomers. The different kinds of lipids include adipose tissue, fats and oils and ALL lipids are hydrophilic or hydrophobic. 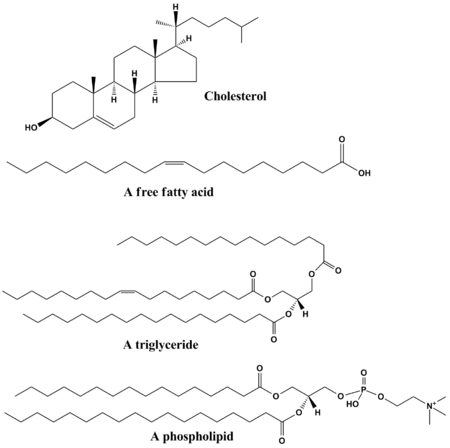 Hydrophilic lipids repel water. Lipids are good sources of stored energy. Molecular structure of myoglobin - iron- and oxygen-binding protein found in the muscle tissue of vertebrates. 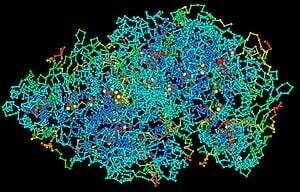 Proteins, as shown in the picture above, are the most complex and the most highly intricate of all organic molecules. Proteins can be categorized as hydrophilic globular protein macromolecules and as hydrophobic fibrous macromolecules. As these names suggest hydrophilic has an affinity for water and, as such, hydrophilic globular protein macromolecules can dissolve in water and hydrophobic fibrous macromolecules have a "fear" of water and, as such, hydrophobic fibrous macromolecules are not soluble in water. Proteins, simply stated, are macromolecules of polymers which consist of amino acids that are bound together with peptide bonds. 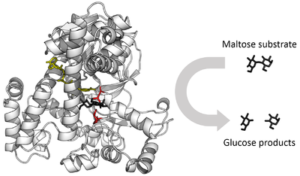 Examples of hydrophilic globular protein macromolecules include hemoglobin in the blood and enzymes. On the other hand, examples of hydrophobic fibrous macromolecules include keratin and collagen. Of the many functions of proteins, the major roles of proteins include their necessity in terms of the structural composition of cell walls and many bodily organs and tissues including hair, skin and muscle, their role in enzymatic actions and their role in terms of hormones, hormonal actions and hormonal regulation. Ribonucleic acid (RNA) and deoxyribonucleic acid (DNA), nucleic acids, are formed with the union of nucleotide monomers. 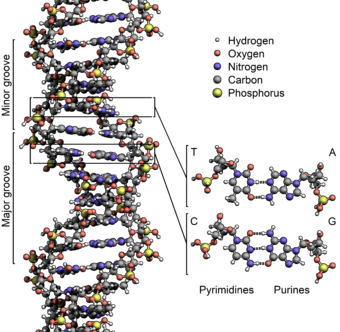 RNA, or ribonucleic acid, as shown in the picture below, is a single helix strand macromolecule that consists of adenine, cytosine, guanine and uracil. RNA and its messenger RNA molecules play a highly important role in terms of copying the information within DNA so that this information can be enfolded and encoded by the genes. Genes will be more fully discussed in the section below this one. DNA, or deoxyribonucleic acid, has similarities and differences when compared to RNA. Both are macromolecules but RNA is a single stranded macromolecule and DNA is a double helix macromolecule; and the base or foundation of DNA is thymine and the base of RNA is uracil. Enzymes are hydrophilic globular protein macromolecules. Enzymes are the biological catalysts that decrease the amount of energy, including heat, that is needed for a chemical reaction and they also speed up the chemical reactions in the body but they themselves are not altered or changed as a result of this reaction; they are simply a catalyst of these chemical reactions which are necessary to life. Enzymes play a highly important role in terms of digestion and most other processes that are involved in metabolism, including cellular metabolism. These enzymes are primarily proteins. Enzymes act on molecular substrates to produce a product. Substrates are molecules and the products of enzymatic action are molecular as well. Some molecules inhibit, slow down and decrease enzymatic actions and other molecules, referred to as activators, speed up and increase enzymatic actions.